Another week is in the books. We are now under 90 days until the marathon kicks off from Staten Island. Am I ready? Only time will tell. Let’s get to the week 5 recap! I meant to wake up early on Monday and do some strength training and yoga again. Instead, I slept in. Oops. Tuesday was my usual 4 miles at a 10k pace. There was very little humidity so I felt pretty good during it. Same with Wednesday’s 6 mile run at half marathon pace. It’s really quite amazing what low humidity can do for your runs in the morning. It can change my pace by anywhere from 30-60 seconds per mile, more if the heat is kicking up too. I’m hoping all this running at warm/humid temperatures will pay dividends on the streets of New York. Thursday was speed/hill day. On the menu: 7×400 repeats. Interesting thing about this…I thought the place I was doing them was flat, but apparently not. I noticed that repeats #2, #4 and #6 were all much slower than repeats #1, #3, #5 and #7. Odds were in one direction, evens in another. Maybe I need to find a new place to do them, or just factor it in to next time. Regardless, the pacing was close to where I want it, and the average between them all was pretty good. Now if only I can run a 5k at that pace! Kind of crazy to think that in order to qualify for Boston, I would need to run faster than that…for 26.2 miles. Eek. Saturday was interesting as well. I was scheduled for 12 miles, but I also signed up for the Overton Park Classic (race report here). I started off around 5:40AM doing laps around the park. I was hoping to knock out 7 miles, but had to quit after 6.4 due to time. 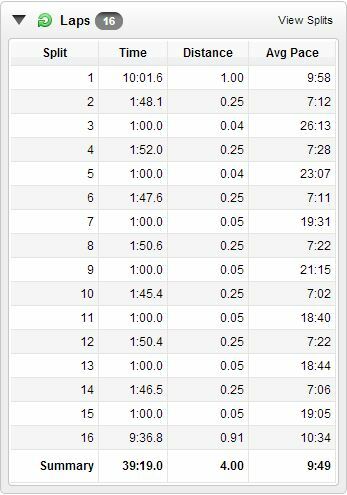 I kept my pacing normal, right around 10 min/mile. As soon as I was done I drove over to the park to get ready for that. Read the race report to see how that went. It as another tough week. I’m looking forward to this week as Saturday is a step-back week. Maybe I’ll actually be able to hit up brunch!